And ... we're off! PostgreSQL 9.2.0 is finally out, and you can now deploy it for production applications. So lemme talk a little about one of my favorite features from the release, as well as linking you to PostgreSQL 9.2 clothing (yes, really, see bottom of post). Back in version 8.4, Itagaki Takahiro introduced a new Extension called pg_stat_statements. This extension creates a dynamic system view which shows you recently executed queries and aggregates both counts and total time to execute. The idea was to give you rapid feedback on which of your queries where "hot" and consuming a lot of system resources, instead of forcing you to wait for logging and log processing and get information the next day. However, pg_stat_statements suffered a major limitation; unlike log processors like pgfouine and pgbadger, pg_stat_statements could only aggregate queries with the same structure and different constants if they were called using the PostgreSQL prepared plans interface. This meant that for the majority of applications (everything except Java, really), queries were not aggregated at all, making pg_stat_statements not that useful in practice. Peter Geoghegan decided to fix that in this release (funded by the folks at Heroku.com), using the query plan for each query to "normalize" out the constants so that identical queries could he aggregated, regardless of how they were sent to the database. Suddenly, that means I can depend a lot less on log processing in order to tell clients what their worst queries are, and I can even troubleshoot potential bad queries in a new application deployment within minutes of it going live. We're going to be installing pg_stat_statements on most of our clients who upgrade to 9.2, and apparently Heroku is going to make it available by default. Peter went a bit further, though, so pg_stat_statements also now collects cache hit/dirty and IO timing information. This gives us ability to diagnose issues with bad application queries which we couldn't do before, even with the delay of log processing. From that, it seems like we're often updating rows which aren't in cache, and paying a heavy price for it. To promote/celebrate/cash in on the 9.2 release, I've posted tshirts and hoodies on the PostgreSQL Zazzle store. These feature an original design by cartoonist Chris Lowrance. 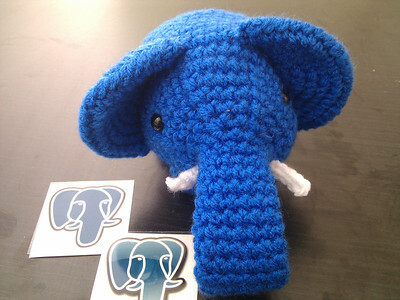 15% of the price of these items goes towards buying swag for PostgreSQL advocacy volunteers. So, get one now! This Tuesday (7:15 PM PDT), we'll be broadcasting the SFPUG meeting live on JustinTV. I'll be presenting "PostgreSQL 9.2: Full Throttle Database", showing off all the features of the new version which is coming out very soon. If you can't make it to the meeting in person, then tune in and watch! If you can make it to the meeting (RSVP here), or at least join the waiting list, then we've got a fun and exciting meeting lined up for you. The meeting is hosted at the new Disqus offices, and we'll have beer and pizza (sponsored by Heroku.com), and cake (sponsored by EngineYard). 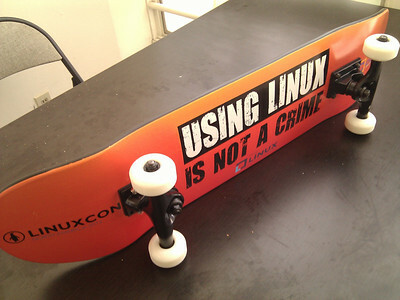 Linux skateboard, courtesy of The Linux Foundation.